From the inception and consultation covering your event, bringing in audio and video equipment, or project managing the entire event from start to finish, Spector-Solutions customizes services and support to meet your requirements. Presentation Graphics - We provide graphic services (powerpoint), for your in room meetings or collaborative computing meetings. Using your original files we can enhance the slides making them presentation ready! Projection systems - Selected to fit your specific environment; screens and projectors for a single meeting room or a large conference or event. Our project manager will select the best screen and projector to fit the meeting room. Specialized lighting - Adding color and depth to stage and oveall ambience of event rooms for large events is critical. 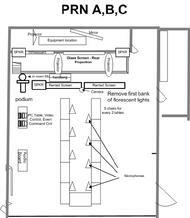 We provide complete lighting systems for the room and stage to enhance and optimize your event or stage show.